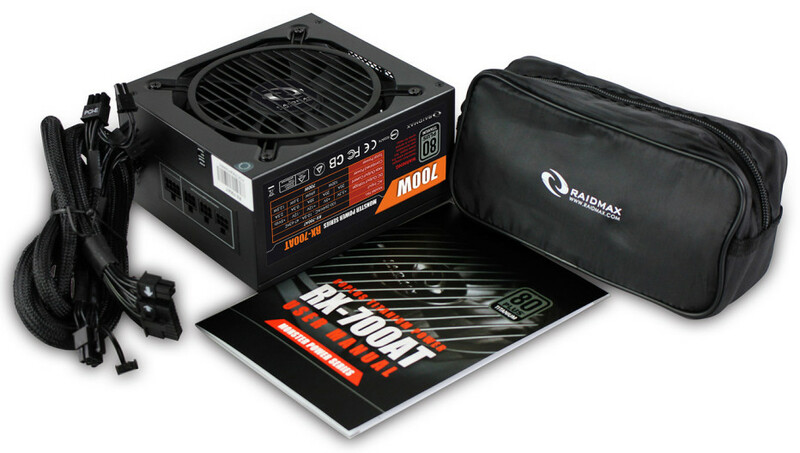 The US company Raidmax has presented a new 700W PSU under the RX-700AT brand name. The device comes housed in a black chassis and offers a cooling fan that sits behind a grid. Thanks to the high-quality components used, the Raidmax RX-700AT comes with 80 Plus Titanium certification for more than 90 per cent of efficiency when under full load. The new PSU has 100 per cent Japanese capacitors, protections against overvoltage, undervoltage, overheating, spikes and more. The PSU has a single +12V rail, which is capable of outputting 58A/696 watts. An 11-blade 120 mm cooling fan takes care of the PSU internals. The new PSU comes with a semi-modular design for less cable clutter and features an ATX connector, a EPS12(4 +4) pin connector, four PCI-E Power (6+2) pins, eight SATA Power connectors, four 4-pin molex connectors, a FDD power connector and more. The PSU measures 165 x 150 x 86 mm (L x W x H) but it is unclear how much it weighs. The price of the new PSU is unknown as of now.